On a rather damp Tuesday May 14th 2013 a large number of people from the village of Box, near Corsham, Wiltshire, pupils from the local schools, members of the Bath Geological Society, and many other interested folk gathered at the Selwyn Hall recreation field for the official opening of the Box Rock Circus. The Circus, the brainchild of local geologist and Earth Science Educator Elizabeth Devon, which had been unofficially unveiled on its completion on the 9th August 2012, has since received an interpretation board entitled ‘Box Rock Circus - A magical circle of rocks, fossils and minerals’ and the fossil moulds inserted into a different position, making them more accessible to the smallest child. Amongst a colourful array of umbrellas, Elizabeth Devon and the Chairman of the Parish Council welcomed everyone to the event after which Professor Iain Stewart, Professor of Geoscience Communications at the University of Plymouth and well known television presenter officially opened the Box Rock Circus. He enthusiastically praised all those who had the foresight to plan and carry out the project and the referred to the ages and conditions of formation of the rock monoliths. He also suggested that other towns and villages should follow the example of Box. BBC Wiltshire Sound was present to record the event, interviewing the enthusiastic pupils of Box Primary School. Following the opening of the Circus by Professor Stewart, a buffet lunch had been prepared for invited guests in the Box Pavilion. Fig. 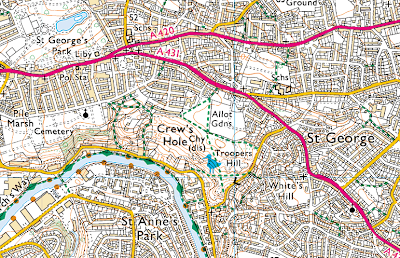 1: Location of Troopers Hill, St George, Bristol. Postcode BS5 8BL. Accessibility: The entrance at Malvern Road provides the easiest access for those with limited mobility. Some of the slopes on this path may mean that some wheelchair users need assistance. The remainder of the paths on the hill are unsurfaced. 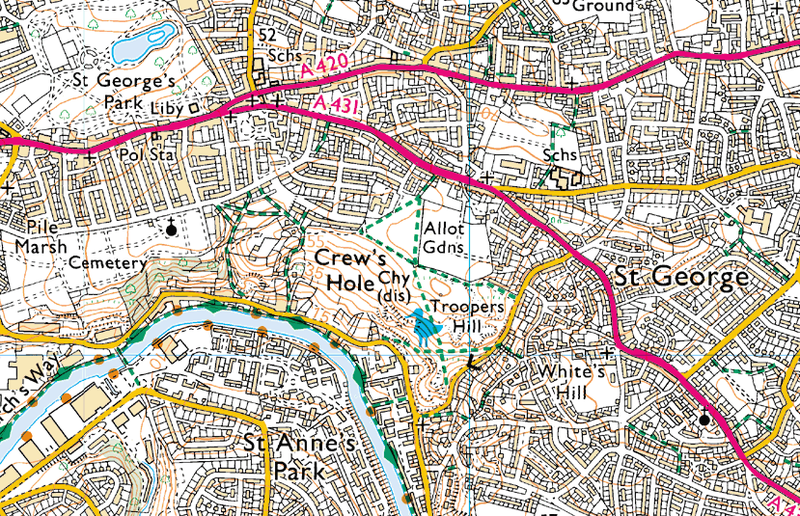 Restrictions: Troopers Hill is owned and managed by Bristol City Council, there is free unrestricted access. 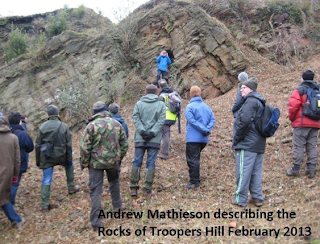 This article has been adapted from Andrew's post on the Friends of Troopers Hill website - the original version can be accessed here and includes a detailed stratigraphic log. Eilene Stonebridge also contributed a great deal of material to the site (see section on geology) and wrote an accompanying leaflet which can be downloaded for free - link at the bottom of this post. 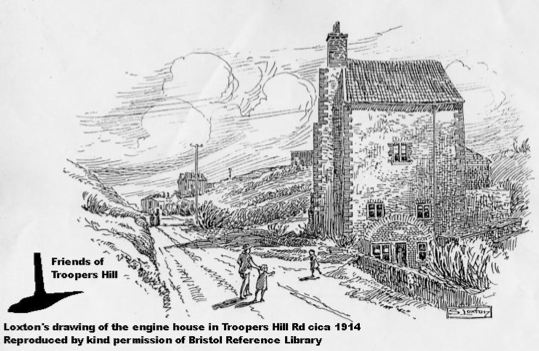 Troopers Hill’s geology is unusual in Bristol. Much of the city lies on Carboniferous Limestone, but Troopers Hill is dominated by sandstone of the Pennant Measures which are sedimentary rocks formed in tropical swamps some 300 million years ago. 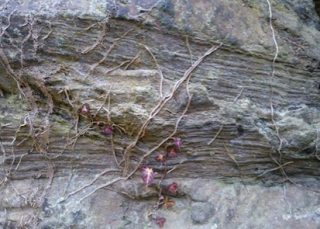 In places, the sandstone can be seen on the surface, both as natural outcrops and old quarry faces. well known to the generations of miners and quarrymen who extracted coal, fireclay and sandstone from them for centuries. However, much of that knowledge has been lost and no one now is quite sure what lies under the hill. men in 1913 on the hill near the bottom of Troopers Hill Road, where sadly a friend of his died after the shaft collapsed. The rocks are sandstone, mudstone, coal and clay, and they all dip to the south at between 25 and 45 degrees. They belong to the Upper Carboniferous Coal Measures, and are near the base of the Pennant Sandstone. The rock types, structures and fossils suggest that they were formed when the area was covered by a forested swamp. At this time (about 300 million years ago) the area is thought to have been near the equator with a tropical climate. The rocks were next squeezed by huge forces, which crumpled them into a large arched fold that runs east-west through Kingswood. The Trooper's Hill rocks lie on the south side of this structure. 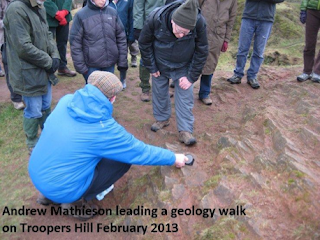 The sandstone at Troopers Hill is called Pennant, since the early geologists took the name traditionally used by miners and quarrymen. The Pennant forms a thick mass of sandstone in the middle of the local Coal Measures around Bristol, as well as in the Forest of Dean and South Wales. The name is thought to have been derived from the Welsh words penn and nant, meaning head of the valley.The rock is well exposed in the Gully Quarry, just south of Trooper's Hill chimney. The sandstones exposed on the north side of the Gully display cross bedding, indicating that the original sand grains were carried by running water in rivers. On the south of the Gully the rocks are coarser grained with coal pebbles and fossil imprints of tree trunks, suggesting that at times the water was flowing fast enough to erode sediment and move large pieces of wood. Pennant was quarried at many sites in the local coalfields and provided stone for thousands of buildings, including the chimney at the top of Trooper's Hill. It sometimes splits into thin slabs which were much used for paving, kerbs, steps, gravestones, and, in earlier times, for roofing. The mudstones were known as duns by the miners. They are less well exposed but can be seen in the paths to the south of Troopers Hill, and they indicate a period when the waters in the swamps must have been still. They had no commercial value. The miners called the coal seams “veins” and gave them names which were used at each pit in the area where they were found, from Newton St Loe, near Bath, to St Phillips Marsh, in Bristol. Some seams thinned to nothing and others split, which made the naming uncertain in places. Each seam is thought to be the compressed remains of deposits of peat, built up from the remains of the trees of the forest. Crewe's Hole Pit was sited at the south end of Troopers Hill, and is marked by the remains of he chimney of the mine engine house. Air Balloon Pit was next to Air Balloon Road, about half a mile north of the Hill. The mining geologist John Anstie was employed to gather information on all the local coal mines for the Royal Commission on Coal. He collected some details of what had been found in these pits, although both were disused when he visited the area in about 1870 and he was concerned that the information might not be completely reliable. He also observed that “the outcrops of the Devil's seam, Buff and Parrot seams, follow parallel lines about 500 yards to the north of those of the Millgrit and Rag seams ... (and at) ..Trooper's Hill .. the shallow works on all of them are clearly traceable.” He noted that the Air Balloon Pit only worked for three or four years as the seams were too variable to be worked economically. 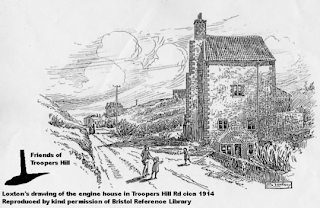 The engine house in Troopers Hill Rd, c. 1914. Reproduced by kind permission of the Bristol Reference Library. Tom Fry was brought up near Troopers Hill and knew the area very well. He recalled one seam 5-6ft. thick revealed on the west side of the hill in 1968 before the council used the area as a rubbish tip. Tom recalled that in around 1910, his father used to warn him of the dangers of the hill, telling him that it was all undermined. His father worked in the Fireclay Mine. Tom also recalled the collapse of an old sloping shaft in the floor of the main quarry, the sides of which had been walled with mortared stone, and that he could trace the sites of at least six shallow mines on the Hill. Fireclay is usually found beneath a coal seam and is basically the clay soil where the trees grew which provided the peat deposits. Fireclay is rich in clay minerals which means that when fired into bricks or tiles, they can withstand high heat. Tom Fry noted that the Troopers Hill fireclay was used to produce high quality terra cotta tiles that were used in many local buildings. Three fireclay beds are known to have been worked beneath Trooper's Hill. Eileen Stonebridge and Andrew Mathieson, of The Avon RIGS Group, have been working for some time with The Friends of Troopers Hill on the interpretation boards in general and the Geological interpretation board in particular. This new board can be seen near the Upper Chimney.